AthenaHealth is a powerful electronic health records (EHR) system for physicians, hospitals, and medical communities that incorporates practice management and care coordination among others. AthenaHealth is comprised of five solutions – Athenaclinicals, AthenaCollector, AthenaCommunicator, AthenaCoordinator, and AthenaClarity. Athenaclinicals is the software’s electronic medical record clinical charting platform while AthenaCollector addresses the practice management requirements of users. AthenaCommunicator provides doctors with a communications platform that allows them to converse with their fellow doctors and patients. Athenacoordinator makes order transmission and information sharing simple. AthenaClarity provides users with a data analytics module that allows users to perform Financial and Operations Management tasks as well as Population Health Management and Care Management functions. AthenaHealth uses tools and services that meet the demands of HIPAA and enable the provider to achieve compliance with ease. AthenaHealth simplifies and streamlines medical documentation with its athenaclinicals module, which is basically the suite’s full service electronic health records (EHR) database. Doctors don’t have to deal with the pain that comes from organizing patient records using hundreds of file cabinets. All records are moved into the cloud where doctors can access quickly and easily. The module automatically updates and doesn’t cost a thing. Are you a doctor who is closely monitoring a patient? Are you performing a medical research and require specific cases to build up your study? Or do you simply want to review a patient’s history? Athenaclinicals makes sure you have the document you need whenever you need them without you digging through hundreds of medical records and files. Athenacommunicator provides patients with a quick and easy access to their doctor’s office though web messaging or email. For specific patients that require specific care, an after-hours phone service can be set up for immediate assistance. Athenacommunicator also helps patients and doctors set up the best schedules for follow-up appointments, significantly reducing the number of amount of no-shows and missed patient appointments. AthenaCollector integrates practice management, extensive rules database, and back-office services into a single, unified platform. This module is specifically developed to help doctors process their claims. With AthenaCollector, doctors don’t have to spend their precious time sending and processing claims. The software does all the hard work, including claim tracking, denial management, and checking patient eligibility. If you are interested in AthenaHealth it might also be a good idea to check out other subcategories of Best Medical Practice Management Software listed in our database of B2B software reviews. There are well-liked and widely used solutions in each software category. But are they automatically the best fit for your company’s special wants? A trendy software solution may have thousands of users, but does it offer what you need? For this reason, do not blindly shell out for popular systems. Read at least a few AthenaHealth reviews and consider the factors that you want in the software such as the cost, main features, available integrations etc. Then, select a few systems that fit your needs. Check out the free trials of these products, read online comments, get clarifications from the seller, and do your research thoroughly. This in-depth research is certain to assist you find the finest software solution for your firm’s special requirements. How Much Does AthenaHealth Cost? 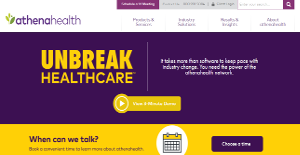 Contact AthenaHealth for enterprise pricing information and other product details. You can also submit a request for a demo to see if the software is a perfect fit for your business. We realize that when you make a decision to buy Medical Practice Management Software it’s important not only to see how experts evaluate it in their reviews, but also to find out if the real people and companies that buy it are actually satisfied with the product. That’s why we’ve created our behavior-based Customer Satisfaction Algorithm™ that gathers customer reviews, comments and AthenaHealth reviews across a wide range of social media sites. The data is then presented in an easy to digest form showing how many people had positive and negative experience with AthenaHealth. With that information at hand you should be equipped to make an informed buying decision that you won’t regret. What are AthenaHealth pricing details? What integrations are available for AthenaHealth?